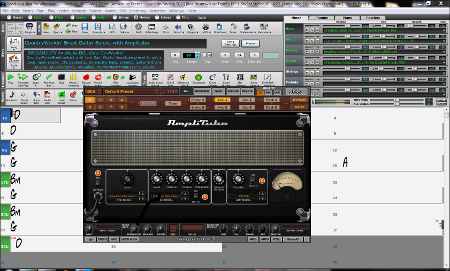 With the release of Band-in-a-Box for Windows Version 2012 we began including the Guitar Amp Simulator "AmpliTube." In addition, there are hundreds of "Direct Input" guitar and bass RealTracks available. These are RealTracks instruments that were recorded with an unamplified ("direct input") signal, allowing you to customize the sound by adding your own effects with AmpliTube. There are a couple of ways to do this: (1) You can load a Band-in-a-Box style or demo song from the StylePicker that is already set to use AmpliTube (type the word "AmpliTube" in the search filter). Or, (2) you can add AmpliTube effects yourself to any song - select a Guitar RealTracks that has Direct Input available. The Amplitube demos are split up into two sections. Or you can Download all our AmpliTube styles, demos, and presets here. This requires Band-in-a-Box 2012 or higher. In this video we show you how to install and set up the AmpliTube VST plugin. Use this Guitar Amp Simulator to customize the "Direct Input" RealTracks. These are various Direct Input (DI) RealTracks guitars & basses being used in actual Band-in-a-Box songs. For each of these examples, there are demos of the same song using AmpliTube, and with the original sounds (the original shipping sounds, not the Direct Input files). This demo features the two Alt-Country Electric Guitar RealTracks, 'Moody' and 'Rootsy'. The 'Moody' style plays held chords for the 'A' section, and switches to a heavier sound playing arpeggiated patterns at 'B'. The 'Rootsy' style plays muted chords at 'A', and switches to held chords at 'B'. Both guitars use Amplitube for an alternate tone. The AM Radio preset loads a collection of pedals that includes chorus, overdrive, and flanger. All effects are routed through the British Tube Lead amp. The amp is routed through an open back vintage cabinet with a sing twelve inch speaker. It has a thin sound with fluctuating tone that is comparable to an AM radio signal. Amplitube preset: Clean Quarter Pulse. The Clean Quarter Pulse preset loads a collection of pedals that includes Compressor, Chorus, Tremolo & Delay. It then uses the American Tube Clean 2 pre-amp & EQ, and a Closed Vintage1 cabinet. It's a great sound for getting an authentic Americana tone. It has a subtle, slow tremolo effect that creates a pulsing sound. This demo features the BluesRock styles from RealTracks Set 86: Electric Bass, BluesRockCrispSteady, BluesRockCrispSync, and BluesRockFuzzy. The "CrispSteady" and "CrispSync" styles alternate at the A & B substyles, while the other styles remain constant throughout. Both guitar styles couple the direct input recordings with Amplitube to create a new, grittier guitar sound. Amplitube preset: Pop Rock Lead. The Pop Rock Lead preset loads two pedals: Graphic EQ and Diode Overdrive. The stomp boxes are routed through the British Tube Lead 1 amp and out through a vintage, closed back cabinet with four twelve inch speakers. The tone is very crisp and distorted, and has the ability to cut through a thick mix. Amplitube preset: Clean and Dirty Mix. The Clean and Dirty Mix preset uses the Graphic EQ and Diode Overdrive pedals. The signal is then split and sent to two amps: the American Tube Clean 2 amp (routed through a vintage bass cab with one fifteen inch speaker) and the British Tube Lead 1 amp (routed through a vintage closed back cabinet with two twelve inch speakers). One amp has a very high gain sound while the other uses a cleaner tone. Together, they create a hybrid sound that almost sounds like two guitars playing the same part. This demo features a Bossa Guitar Trio, with the guitar track using Amplitube to create a tremolo guitar tone. Gives an otherwise elegant style a quirky "kitsch" factor. Amplitube preset: Triplet Pulse. The Triplet Pulse preset includes a collection of pedals that includes Compressor, Graphic EQ, Flanger, Delay, and Tremolo. They are routed through the American Tube Clean 2 amp and a vintage closed back cabinet with two twelve inch speakers. The result is a clean, slightly muffled tone with a rapid tremolo pulse. This demo features the CountryWorkinBrent soloist, with the DI guitar used in conjunction with Amplitube to get a clear, open sound. It's backed up by electric bass, acoustic guitar & drums. Amplitube preset: Low Gain Studio. The Low Gain Studio preset uses a Compressor stomp box routed through the American Tube Clean 2 amp and a vintage open back cabinet with four ten inch speakers. The tone creates a very open feeling, as if the amp was recorded with a stereo pair of microphones at a long range. A small amount of gain is added for character. This RealStyle loads the CountryWorkinBrent guitar soloist, and uses the DI guitar with Amplitube to create a thick, distorted chorus sound. The rhythm section is comprised of electric bass, acoustic guitar, and the NashTrainEv16 RealDrums style. Amplitube preset: Dual Amp Chorus. The Dual Amp Chorus preset uses the Chorus, Diode Overdrive, and Delay stomp boxes. The signal is then split and routed to the American Tube Clean 2 amp (with a vintage open back cabinet carrying four ten inch speakers) and the British Tube Lead 1 amp (with a vintage closed back cabinet holding four twelve inch speakers). The result is a distorted and heavily chorused tone that creates a very thick sound for lead or rhythm parts alike. This demo features a Country Boogie band of electric bass, acoustic guitar, electric guitar & RealDrums. The electric guitar uses the Direct Input version, and loads the Country Twang Amplitube preset to get a different tone. Amplitube preset: Country Twang. The Country Twang preset uses a Compressor stomp box before the signal is split. It then passes through the American Tube Clean 2 amp (with a vintage closed back 2x12 cabinet) and the Solid State Bass amp (with a vintage bass cabinet holding one fifteen inch speaker). The american amp focuses on the higher frequencies while the bass amp focuses on the lower ones. The result is a scooped sound that is meant to emulate a classic country twang tone. This demo features four of the Crossover styles from RealTracks Set 59. TAll of the instruments blend well together, joined by the NashCrossovr RealDrums style. The two electric guitars use direct input recordings coupled with Amplitube to create a slightly heavier tone. Amplitube preset: Mega Power Chord. The Mega power Chord preset uses a collection of pedals including Volume, Compressor, and two Diode Overdrive pedals. The signal is then split and sent to the British Tube Lead 1 amp (with a vintage closed back 4x12 cabinet) and the Solid State Bass preamp (with a vintage 1x15 bass cabinet). Both signals share digital delay and parametric EQ rack units. The result is a very heavy, modern rhythm sound that works best with straight power chords. The Country Twang preset uses a Compressor stomp box before the signal is split. It then passes through the American Tube Clean 2 amp (with a vintage closed back 2x12 cabinet) and the Solid State Bass amp (with a vintage bass cabinet holding one fifteen inch speaker). The american amp focuses on the higher frequencies while the bass amp focuses on the lower ones. The result is a scooped sound that is meant to emulate a classic country twang tone. This demo features the PopSw16Sync electric bass style from RealTracks set 124, along with the PopCrossover electric guitar style from set 125. It's joined by the previously released CrossoverGroovin electric guitar & pop organ. In this style the organ was recorded as an even 8ths style, but since it's largely whole notes, it also works with this swing 16ths groove. The chord progression begins in the key of A, and modulates to the relative minor for the B section. The bass uses direct input recordings with Amplitube to create a distinct tremolo tone. Amplitube preset: Stutter Frog Bass. The Stutter Frog Bass preset uses a large collection of pedals including two Compressors, Tremolo, Graphic EQ, and Delay. All pedals are then routed through the Solid State Bass amp and a vintage bass cabinet with one fifteen inch speaker. After being captured by a dynamic small diaphragm mic the tone is routed through a digital delay rack unit. The result is a novel bass tone useful in modern pop or R&B scenarios. This demo features the Dire 140 Electric Guitar Soloist, and also uses the Dire 140 Rhythm Guitar style. Both electric guitars use direct input recordings coupled with Amplitube to create new and unique tones. Electric Bass and Acoustic Guitar RealTracks along with NashvilleEv8 RealDrums round out the sound. This superbly clean soloist can be used in any key, over any changes you care to throw it's way! Amplitube preset: Slap Back Blues. The Slap Back Blues preset uses the Delay stomp box routed through the Solid State Bass preamp and a 2x12 closed back vintage cabinet. The result is a classic blues tone with a medium amount of gain and a classic slap back delay. The Cloudtop Flange preset uses a large collection of stomp boxes including Compressor, Graphic EQ, Flanger, Chorus, and two Delays. The outgoing signal is sent to the American Tube Clean 2 amp and a 4x12 closed back vintage cabinet. The result is an etherial pop tone that makes an interesting lead sound. This demo uses the slower ballad tempo of the "CleanBarre" Strumming Electric Guitar style from RealTracks Set 87. The direct input recordings of the guitar are coupled with Amplitube to create a new and unique guitar tone. This guitar tone gives the entire tune an ethereal quality, and would work well used in the context of a film soundtrack. It's joined here by both Strumming and Fingerpicking Acoustic Guitar, "PopHalfNotes" Electric Bass, and RockLiteEven8 RealDrums. Amplitube preset: Shimmering Distortion. The shimmering Distortion preset uses the following stomp boxes: Chorus, Diode Overdrive, Graphic EQ, and two Tremolos. All FX are sent to the Solid State Bass amp and a 1x12 open back vintage cabinet. The signal is then captured by a small diaphragm dynamic mic and routed through a parametric EQ rack unit. The title describes the tone - thick distortion with a sparkling shimmer. This mid-tempo even 8ths RealStyle uses the direct input recordings of the strumming electric guitar style coupled with Amplitube to create a new and unique tone. This tune is played in the key of G minor, but these RealTracks style can be used in any key. This RealStyle also uses the PopHalfNotesPush Electric Bass RealTracks style. Amplitube preset: Air Bender. The Air Bender preset uses Compressor, Delay, and Flanger stomp boxes routed through the American Tube Clean 2 amp and a 4x12 closed back vintage cabinet. The sound is captured by a small diaphragm dynamic mic and sent to the Digital Delay rack unit. The final tone is very uniquely affected and clean - almost as if air is being 'bent' to create the sound. This demo features a low-fi blues band with a slide guitar soloist. The bass here uses direct input recordings along with Amplitube to create a unique tone. Amplitube preset: Light Autowah Bass. The Light Autowah Bass preset uses an autowah pedal surrounded by two compressors. The signal is sent to the Solid State Bass amp and a vintage 1x15 bass cabinet. The resulting tone is recorded by a large diaphragm condenser mic and sent to the Parametric EQ rack unit. The tone has a notable attack that adds a percussive effect and bite to any bass sound. This demo features all of the styles from RealTracks Set 83: LA Hard Rock. Both guitars as well as the bass use direct input signals combined with Amplitube to create new, unique tones. Amplitube preset: True Grit Bass. The True Grit Bass preset uses a collection of pedals including Compressor, Graphic EQ, Diode Overdrive, and Flanger. The signal is then sent to the American Tube Clean 2 amp and a vintage 1x15 bass cab. The tone is distorted and gritty with a slight growl that both cuts through a mix and fits in nicely. The Burning Tubes preset starts with Delay, Diode Overdrive, and Graphic EQ stomp boxes. The signal passes through the Solid State Bass amp and out to a vintage closed back 4x12 cabinet. The signal is picked up by a large diaphragm condenser and a small diaphragm dynamic mic and passed through a parametric EQ rack unit. The result is a heavy, mid EQ distortion that signifies the burning glow of tubes when you crank that gain knob. Amplitube preset: Gain and Chorus. The Gain and Chorus preset uses Compressor and Chorus stomp boxes sent to the American Tube Clean amp and a 4x12 closed back vintage cabinet. The result is a highly versatile tone with a modest amount of gain and a thick ensemble chorus. This demo features a quartet of jazz realtracks, with the electric guitar taking the lead. It's backed up by acoustic bass & piano from RealTracks Set 55, and the JazzBrushesSticks RealDrums style. The guitar uses Amplitube for a distinct chorus tone. Amplitube preset: JC Jazz Chorus. The JC Jazz Chorus preset uses two stomp boxes: Compressor and Chorus. The signal is routed through the American Tube Clean 2 amp and a 1x12 open back vintage cabinet. The tone is meant to replicate the tone of the classic JC or Jazz Chorus amps. This demo features a slow jazz ballad played by a Jazz Trio of Acoustic Bass, Electric Guitar & Drums. The guitar track uses Amplitube to create a bright ensemble chorus tone. Amplitube preset: Ensemble Chorus. The Ensemble Chorus preset makes use of Chorus and Compressor stomp boxes. The sound is sent to the American Tube Clean amp and a 2x12 closed back vintage cabinet. The subsequent tone is a modest yet bright jazz sound with a subtle ensemble chorus effect. This RealStyle features the slow-mid tempo jazz-swing electric guitar soloist, backed up by a RealTracks trio of piano, acoustic bass & JazzBrushes RealDrums. The demo uses common jazz progressions, with a variety of II-V-I's, almost exclusively with one chord per bar. The jazz-swing electric guitar soloist uses Amplitube to enhance the guitar tone. Amplitube preset: Soft Jazz Echo. The Soft Jazz Echo preset uses no stomp boxes, just the American Tube Clean 2 amp and a vintage closed back 2x12 cabinet. This sound has a well rounded classic jazz tone that is highly versatile. This RealStyle features a JazzWaltz electric guitar solo. The 'JC Jazz Chorus' Amplitube preset is used to create a rich chorus tone. The backing instruments are piano and acoustic bass from RealTracks Set 76, along with the JazzBrushesWaltz drum style from RealDrums Set 2. The chord progression is a very common one in jazz, but it has the unique aspect that while it's in the key of G, it doesn't actually play a Gmaj7 chord until the last 2 bars of the 32 bar form. This has the effect of constantly pushing toward the conclusion of the song, drawing the ears in it's direction. This All-RealTracks demo features the 'PopBalladClean' electric guitar style, along with pop organ, strummed acoustic guitar, PopHalfNotesSync electric bass, and NashvilleEven16 RealDrums. The PopBalladClean electric guitar plays a syncopated arpeggio pattern for 'A', and switches to a straighter strumming rhythm at 'B'. The direct input guitar recordings are used with Amplitube to create an alternate tone. Amplitube preset: Modern Pop Rhythm. The Modern Pop Rhythm preset uses a Compressor stomp box sent to the American Tube Clean 2 amp and a vintage closed back 4x12 cabinet. The sound is very bright and present with a long delay. It is very useful in pop scenarios where individual notes are being played. This demo feature the Fast Memphis Swing electric guitars, both with the Direct Input versions selected, and different Amplitube presets applied to create a brand new overall sound. Amplitube preset: Low Gain Studio. The Low Gain Studio preset uses a Compressor stomp box routed through the American Tube Clean 2 amp and a vintage open back cabinet with four ten inch speakers. The tone creates a very open feeling, as if the amp was recorded with a stereo pair of microphones at a long range. A small amount of gain is added for character. The Classic Crunch preset skips the stomp boxes and takes the purist approach. The British Tube Lead 1 amp is used with a vintage closed back 4x12 cabinet. This is one of my favourite presets out of the bunch - it sounds great in rock, country, or pop scenarios and acts as the staple classic crunch tone we all know and crave. This demo features all of the "NorthernRockBallad" styles from RealTracks Set 89, including electric bass, banjo, acoustic guitar & high-strung acoustic guitar. The bass here loads the Direct Input variation, and applies the 'Heart Beat Slap Back' Amplitube preset. Amplitube preset: Heart Beat Slap Back. The Heart Beat Slap Back bass preset starts with the Compressor, Graphic EQ, and Delay stomp boxes. The sound is then sent to the Solid State Bass Preamp and a vintage bass cabinet with a single fifteen inch speaker. The result is a round bass tone with a classic slap back echo effect. This demo features the PopCalypso RealTracks from RT Set 106. It features accordion, both acoustic & electric guitars, electric bass, and the PopCalypso RealDrums style. The electric guitar uses the direct input recordings coupled with the 'Low Gain Studio' Amplitube preset to create an alternative guitar tone. This demo features all of the "PopRockWaltz" RealTracks styles, the two electric guitars and the 12-string acoustic guitar from RealTracks Set 67, and the electric bass from RealTracks Set 108. This groove can be thought of either as a waltz or as a 6:8 groove. The electric guitars use the direct input recordings coupled with Amplitube to create modern tones. The Porcelain Echo preset uses a collection of stomp boxes that include: two Flangers, a Diode Overdrive, and a Delay. The signal is sent to the Solid State Bass amp and a 1x15 vintage bass cabinet. The goal of this preset is to recreate the echo, resonance, and tone that you would encounter in a bathroom. Amplitube preset: Solid State Crunch. The Solid State Crunch preset starts with Diode Overdrive, Graphic EQ, and Delay stomp boxes. Next in line is the Solid State Bass amp and a 2x12 closed back vintage cabinet. The result is a crisp and present solid state crunch sound that cuts through any mix. This demo features the PopAmerican electric guitar styles, both with the direct input variations loaded, and Amplitube presets applied. It starts off with all instruments muted except that guitar and the drums, and at bar 7, the bass, 2nd electric guitar and acoustic guitar RealTracks all join in. The Wonderful Warble preset utilizes two chorus pedals. The signal is then routed to the British Tube Lead 1 amp and a 2x12 closed back vintage cabinet. The result is a rapid warble effect that is best suited for R&B, Rock, or pop music. This RealStyles features a full Smooth Jazz rhythm section playing a cool Smooth Hip-Hop groove. Featured here is the SmoothJazzCool swing 16th electric guitar from RealTracks Set 93, along with electric piano, 5-string bass and RealDrums from previous sets. The electric guitar uses Amplitube for a dreamy jazz tone. Amplitube preset: Jazz Dream. The Jazz Dream preset starts with a large collection of stomp boxes: Compressor, Flanger, Chorus, Delay, Tremolo, and Graphic EQ. The chain of pedals is then routed to the American Tube Clean 2 amp and a 2x12 closed back vintage cabinet. The result is a dreamy jazz tone that is both present and laid back. This demo features a blues slide guitar solo, backed up by texas boogie electric guitars, blues bass & NashvilleShuffle RealDrums. The soloist and one of the rhythm guitars use the direct input variations, along with two different Amplitube presets to provide unique new tones. This is a basic 12-bar blues, but alternates between the key of G and the key of C every 12 bars. Amplitube preset: Soft Gain Tremolo. The Soft Gain Tremolo preset begins with the Opto Tremolo and Diode Overdrive pedals. The signal is then split and sent to the American Tube Clean 2 amp (with a vintage open back 1x12 cabinet) and the Solid State Bass amp (with a 1x15 vintage bass cabinet). The tone has a modest amount of gain and rapid tremolo for dramatic effect. This demo features the 70s Soul RealTracks styles. The two electric guitars load the direct input variations, and apply two different Amplitube presets: 'Low Gain Studio' and 'Underwater Lounge'. The variation of the piano in this particular realstyle features a real acoustic piano, with the notes being duplicated on synth. The drums in this variation have an added percussion layer also. The Underwater Lounge preset starts with a chain of stomp boxes: Compressor, Autowah, Flanger, and Graphic EQ. Next in line is the Solid State Bass preamp and a vintage 2x12 closed back cabinet. The signal is captured by a large diaphragm condenser mic and routed through a Parametric EQ rack unit. The result is an 'underwater' loungy tone that is perfect for a special song that requires something different. This demo features the "SouthernRock" RealStyle, with electric bass from RealTracks Set 124, both electric and acoustic guitars from Set 43, and the RockSouthernEv^ RealDrums style from RD Set 21. The sound is rounded out by including pop B3 organ from RT Set 47. The electric guitar uses the direct input variation, and the 'Clean and Dirty Mix' Amplitube preset is added. The bass plays mostly half notes at the first half of the bar, followed by a staccatto 8th & dotted quarter. This basic groove is then embellished, and locks in beautifully with the drums & other instruments. Amplitube preset: Clean and Dirty Mix. The Clean and Dirty Mix preset uses the Graphic EQ and Diode Overdrive pedals. The signal is then split and sent to two amps: the American Tube Clean 2 amp (routed through a vintage bass cab with one fifteen inch speaker) and the British Tube Lead 1 amp (routed through a vintage closed back cabinet with two twelve inch speakers). One amp has a very high gain sound while the other uses a cleaner tone. Together, they create a hybrid sound that almost sounds like two guitars playing the same part. This RealStyle features the TexasBluesRock electric guitars, one of which uses the direct input variation and loads the 'Snappy Treble' Amplitube preset to provide an alternate guitar tone. Amplitube preset: Snappy Treble. The Snappy Treble preset starts with a Graphic EQ pedal. The signal is then sent to the British Tube Lead 1 amp and a 2x12 closed back vintage cabinet. The cab is recorded by two small diaphragm dynamic mics in a tight stereo pair and sent to a Parametric EQ rack unit. This preset has a nice snappy bite and a great deal of trebly presence. This all-RealTracks demo features the HardRockThrash RealTracks styles. This electric bass uses the direct input variation along with Amplitube to create a fuzzy, distorted tone. Other instruments in this RealStyle include 2 electric guitars, B3 Organ from RT Set 47, and the RockThrashHalfTimeEv16 RealDrums style. The particular variation of this RealDrums style used here plays a closed hi-hat for the A section, and switches to the crash cymbal, using it like a ride, for the B section. Amplitube preset: Super Fuzz Bass. The Super Fuzz Bass starts with a lineup of four stomp boxes: Graphic EQ, two Diode Overdrives, and a Compressor. The signal is sent to the British Tube Lead 1 amp and a 1x15 vintage bass cabinet. Everything is captured by a small diaphragm dynamic mic and sent to a Parametric EQ rack unit. The resulting tone is a down and dirty, low EQ fuzz that compliments heavy modern guitars very well in any Rock situation.